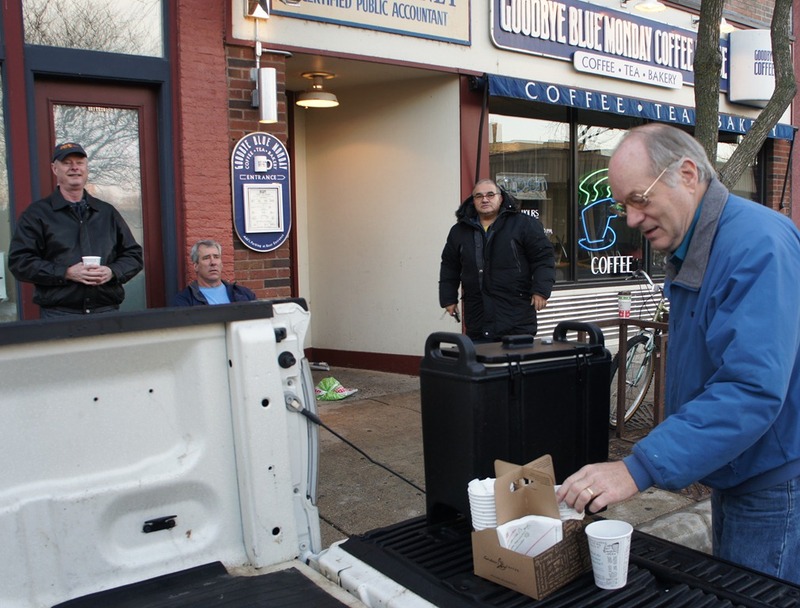 Goodbye Blue Monday is closed on Thanksgiving but for several years now, a gang of morning regulars has been serving up free hot coffee to customers who stop by, thinking that the coffeehouse is open. Yesterday when I stopped by, Jim Crow, Jim Gleason, and Jose Rodriguez were the beauties on duty. Where did they get the coffee? Caribou! On this Thanksgiving Day, 2010, what are you thankful for that’s Northfield-related? What are you thankful for that’s Northfield-related? Instead of submitting a laundry list in one comment, submit a sentence or two that describes just one thing. And then, if you have another item to submit, add it later. Another? Add it later. I bet I can think of a couple dozen things that I’d like to add eventually. You can expand on what others post but don’t take issue with what others post. It should be an all-positive, conflict-free, comment thread. All other Locally Grown discussion guidelines apply.